Overall silvery in life; in preserved fish, back and upper sides olive gra) shading to white on lower head and belly. Sides with 6-7 horizontal, dark stripes. Vertical fins pigmented; little or no pigment on paired fins. 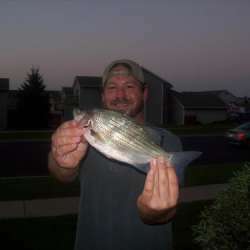 For more White Bass photos visit Lake-Link's Photo Gallery. 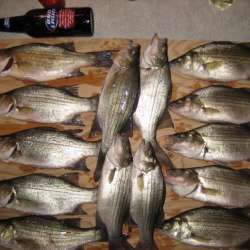 In Wisconsin the white bass occurs in the Mississippi River and Lake Michigan drainage basins. It is found in the bays of Lake Michigan, and particularly in southern Green Bay. 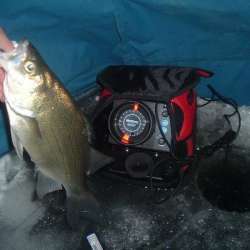 The white bass is common in large lakes and rivers of the southern half of Wisconsin. Spawning occurs from late April to June, and is tem- perature dependent. High temperatures early in the season were associated with an early run, and a rapid rise in temperatures was correlated with an increase in the intensity of spawning and with a shorter spawning period. 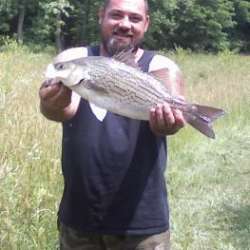 White bass apparently prefer the running water of tributary streams for spawning. 4 lbs 14 ozs caught by Bruce Wilson caught on Kaskaskia River on October 7, 1981. 4 lbs 3 ozs caught by James Wagner caught on Lake Freeman on January 1, 1965. 3 lbs 14 ozs caught by Bill Born caught on West Okoboji on May 1, 1972. 6 lbs 11 ozs caught by David Kraushaar caught on Lake Huron/Sag. Bay on January 1, 1989. 10 lbs 12 ozs caught by Jeff Van Broklin caught on Kalamazoo River on January 1, 1996. 4 lbs 2 ozs caught on Mississippi River on May 4, 2004. 4 lbs 6 ozs caught on Okauchee Lake, Waukesha County on September 24, 1977.